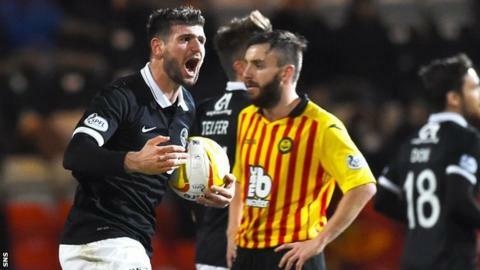 Nadir Ciftci saved a point for high-flying Dundee United as they struggled to cope with a Partick Thistle side decimated by illness and injury. Gary Mackay-Steven's early finish - his third goal in two games - appeared to put the visitors in control at Firhill. But Thistle fought back into the game through a Ryan Stevenson header and a Kris Doolan tap-in. It looked like Thistle would record their first win over United since March 1995 until Ciftci's fine finish. United manager Jackie McNamara will have mixed emotions after an exciting encounter with his former club - missing a chance to overtake Celtic and move into second place in the Scottish Premiership, yet lucky to escape with a point after another disjointed away performance. Despite Thistle having an extra festive rest thanks to Thursday's postponement against Celtic, counterpart Alan Archibald was still only able to find five fit men for his substitute's bench. Kallum Higginbotham, Abdul Osman, Danny Seaborne and Christie Elliot were all ruled out, while James Craigen dropped into a dugout two short of the regulation seven. Doolan, Steven Lawless and Dale Keenan returned to the side as teenagers Liam Lindsay and Declan McDaid were thrown in for their first starts. In contrast, McNamara stuck by the line-up that took apart Dundee in the New Year's Day derby. Looking buoyed by that victory, United immediately took the game to the makeshift hosts and an early save from Paul Gallacher prevented Mackay-Steven adding to his two goals against the Dark Blues. It didn't take long for the Scotland cap to make up for that miss as he was found in yards of space behind the Thistle defence by Ciftci's sublime chip and then clipped it past Gallacher and into the far corner of the net. United's swift counter-attacks had Thistle reeling, but the home side somehow steadied themselves and already had a penalty claim denied before levelling, thanks in part to some poor defending. Gary Fraser's corner kick found Stevenson unmarked 14 yards out and the forward's header looped over poorly positioned goalkeeper Radoslaw Cierzniak. It was United's turn to look shell-shocked in the face of the opposition's confident passing and Doolan had already forced Cierzniak into a fine, near-post block before putting Thistle into the lead. McDaid was unable to direct Fraser's low cross towards goal under pressure, but Doolan pounced to fire home the loose ball and two more Cierzniak saves - to deny Lawless and Fraser - prevented further damage to United by half-time. McNamara brought on young midfielders Blair Spittal and Charlie Telfer for John Rankin and defender Keith Watson. Tiring Thistle looked to have stifled the more attacking formation until the introduction of forward Ryan Dow in place of Chris Erskine was swiftly followed by a lightning break from Mackay-Steven. The winger weaved his way from his own half to edge of the Thistle box before setting up Ciftci for a deft finish to extend United's unbeaten run against the Glasgow side to 17 games. Match ends, Partick Thistle 2, Dundee United 2. Second Half ends, Partick Thistle 2, Dundee United 2. Attempt missed. Stuart Armstrong (Dundee United) right footed shot from outside the box is just a bit too high. Corner, Dundee United. Conceded by Conrad Balatoni. Attempt missed. Charlie Telfer (Dundee United) right footed shot from outside the box is too high. Attempt missed. Ryan Dow (Dundee United) left footed shot from the left side of the box is close, but misses to the right. Attempt missed. Steven Lawless (Partick Thistle) left footed shot from a difficult angle on the left is close, but misses to the left. Declan McDaid (Partick Thistle) wins a free kick in the attacking half. Attempt missed. James Craigen (Partick Thistle) right footed shot from outside the box is high and wide to the left. Substitution, Partick Thistle. James Craigen replaces Stuart Bannigan. Goal! Partick Thistle 2, Dundee United 2. Nadir Ciftci (Dundee United) right footed shot from the centre of the box to the top left corner. Assisted by Gary Mackay-Steven. Substitution, Dundee United. Ryan Dow replaces Chris Erskine. Calum Butcher (Dundee United) is shown the yellow card. Conor Townsend (Dundee United) wins a free kick on the right wing. Stephen O'Donnell (Partick Thistle) is shown the yellow card. Foul by Stephen O'Donnell (Partick Thistle). Corner, Dundee United. Conceded by Kris Doolan. Substitution, Dundee United. Blair Spittal replaces John Rankin. Substitution, Dundee United. Charlie Telfer replaces Keith Watson. Attempt missed. Nadir Ciftci (Dundee United) right footed shot from outside the box is too high from a direct free kick.